While on a recent trip as an Hadassah emissary to Mexico, Professor Eitan Kerem, Head of the Pediatric Department at Hadassah Medical Center, spoke about the impact that Hadassah’s cutting edge Stem Cell research is making, particularly in the areas of improving vision problems due to macular degeneration, repairing damaged hearts, and with neurological diseases such as MS and ALS. 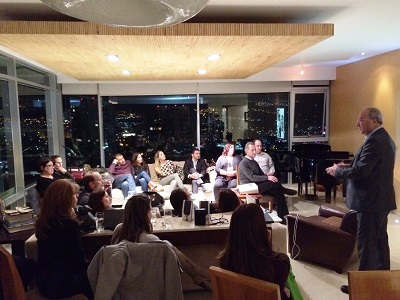 Professor Kerem was the featured speaker at meeting of Hadassah Mexico volunteers and donors. Organized by Ethel Fainstein, Director of Hadassah Mexico and Jorge Diener, Director of Hadassah International Special Projects, this meeting was held in an elegant private home. The attendees expressed their appreciation of having the opportunity to learn first-hand about Hadassah’s outstanding research that is benefiting people around the world. Stem Cell research for Heart Disease: Hadassah has been using stem cells to regenerate new blood vessels in the heart to compensate for those that are occluded. Research in this area is in progress to treat severe cardiac problems. More research is needed, but Prof. Kerem foresees that this technology will become widely available in the next 10-15 years. Stem Cell research to improve vision: Hadassah is well advanced in developing a technique that reverses macular degeneration. Through injections directly into the eyes of an individuals who are already blind, Hadassah has shown in preliminary trials that stem cells can reverse the disease and allow them to see. There is a long list of people waiting to participate in these trials. Stem Cell research to restore neurons: Hadassah has conducted trials that show that stem cells derived from bone marrow can be transformed into neurons. This research is aimed to help patients with severe neurological diseases such as MS and ALS.